Firefox web browser has a neat feature called tabbed browsing where users can surf the Internet and loads the Web pages in separate tabs of a single browser window without the need to open multiple browser windows that filling up the taskbar and messing up the desktop space. But tabbed browser also have higher chance of user unknowingly or accidentally closes a tab which he or she still wants to browse. If the web page in that tab contains important information or valuable works, and not been bookmarked, then the user might have hard time trying to find back the website or page link location URL again. To avoid this problem, Firefox users can use and upgrade to Firefox 2, which has improved tabbed browsing features. Among the features is ability for users to re-open an accidentally closed tab by using a shortcut Ctrl+Shift+T, or by right clicking on the tab bar, the select Undo Close Tab. Firefox 2 will cache and keep track of a list of recently closed tabs in the History menu so that after the web page in the tab has been closed, but Firefox can still retrieves it and displays the web page on the new tab. What if you want to reopen recently closed tabs, not the last closed tab? In Firefox, just go to History -> Recently Closed Tabs (Press Alt key to reveal the menu bar). 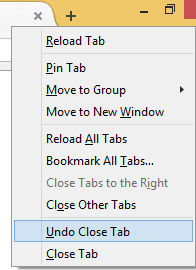 In newer versions of Firefox, you can also view and restore any recently closed tabs through Options -> History. undoclosetab 20040617 (no longer available and not updated since 2004, you may need to read through the comments to find updated version by other users). Most of these Firefox add-ons offer more than simply allow users to reopen (accidentally) closed windows and tabs, or after the tab or window crashes.